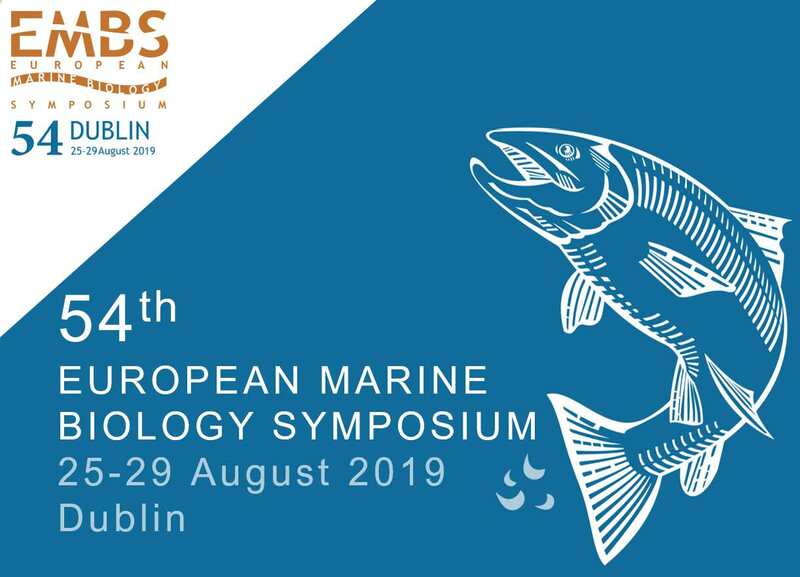 In addition to the great speakers, we are working on a great programme of social events and excursions for the 54th European Marie Biology Symposium in Dublin on 25-29 August this year. Options will include a cruise around Dublin Bay, a visit to scenic Glendalough and its ancient monastic settlement, and canoe excursions on the Liffey in Dublin itself or out on Dublin Bay. The Yellow Submarine competition will have its roots in Irish traditions and there will be a ceilidh after the conference dinner. The April 3rd deadline for abstract submission is approaching and abstracts are being accepted via the website – www.embs54.org. As well as a general session on any aspect of marine biology, the themes this year will focus on blue growth, rapid change, fundamental traits and movement and redistribution of species. Details of registration are also available on the website. We have aimed to keep the costs low and flexible and really hope that you will be tempted to join us in Dublin this August! 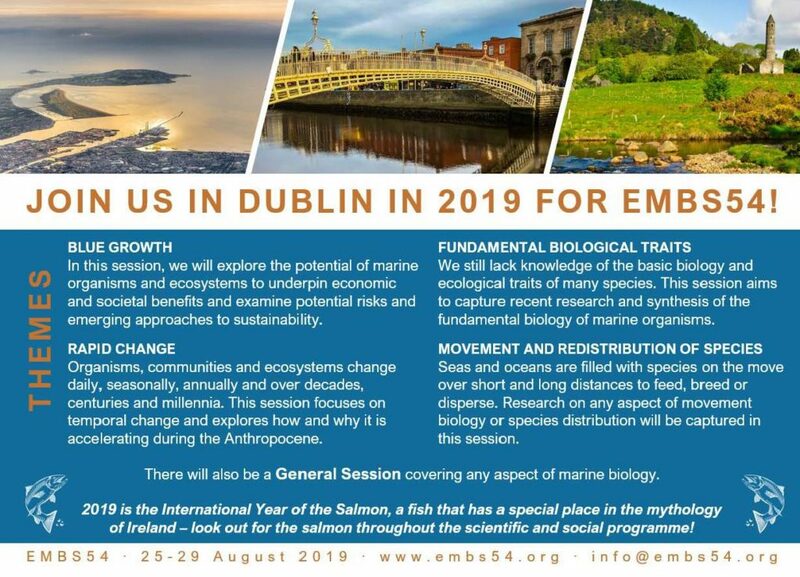 A great line up of keynote speakers is now confirmed for EMBS 54, to be held in Dublin on 25-29 August2019. Details are available at the website. 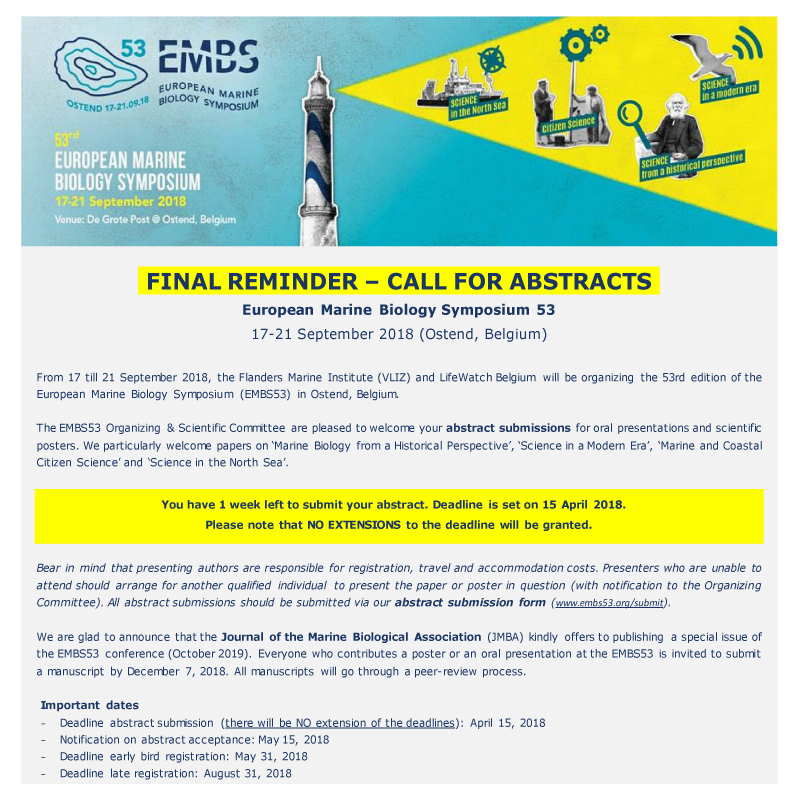 We hope you will consider joining us for what should be an excellent symposium, with sessions on Blue Growth, Rapid Change, Movement and Redistribution of Species and Fundamental Biological Traits, as well as a General Session on any aspect of marine biology (visit www.embs54.org for details). The EMBS series has been running annually since 1966. It attracts delegates from all over the world, who come to discuss high quality marine biological research in a friendly and sociable atmosphere. EMBS54 is organized by University College Dublin. The deadline for submissions is 3 April 2019. You will receive a notification as to whether your abstract submission has been accepted by 1 May 2019. For more information, contact earth.institute@ucd.ie. I am delighted to be able to provide you with the MARS newsletter with details on the launch of our brand new strategy “Supporting a decade of Marine Science in Europe and beyond”. The new strategy supports our vision for “a network of connected marine stations across Europe, which are well-positioned to meet the future scientific and societal challenges for the marine environment from the national to the global level”. This is an exciting time for MARS and we would therefore welcome feedback on the contents of this newsletter and on the new strategy in general. If you are not currently a member of MARS and would like to be then please contact me directly at matfr@mba.ac.uk. More information on MARS membership can be found here. The closing date for applications is July 20th 2018 – h. 12.00. 2017 marked a decade since the World Register of Marine Species (WoRMS) was established. In that time, 21,554 marine species new to science have been described and added to the register. The oceans cover over 70% of the surface of our planet, and yet they still include the least explored regions (http://theconversation.com/how-many-undiscovered-creatures-are-there-in-the-ocean-86705). After 250 years of describing, naming and cataloguing the species we share our planet with, we are still some way off achieving a complete census. However, we now know that at least 242,500 marine species have been described because their names are managed in the World Register of Marine Species (WoRMS) by almost 300 scientists located all over the world.Since the WoRMS was founded in 2007, the number of species on the list has doubled from 120,000 to 242,500. Interestingly, the number of names in the database is actually almost double this figure (477,500), because many names are no longer valid. This can be for a variety of reasons including synonymy (more than one name for the same species), homonymy (more than one species given the same name) and changes to the classification of a species (reflected by a changed combination of species and genus name). The number of new synonyms and homonyms created is likely now far less than in the past due to faster publication and easier access to data. Still, every year around 20,000 unaccepted names are added to WoRMS, each linked to the valid name in the database (Vandepitte et al., 2018). Every year almost 2,000 marine species new to science are added to the register. This includes species from relatively well-known groups such as fish, almost 1,300 of which were described in the last decade. Yet, it is among the least studied and most diverse animal groups (molluscs & crustaceans) and in the least explored habitats (tropical shallow seas & deep oceans) that most undiscovered creatures likely remain. Just over 6,000 new marine crustaceans and almost 8,000 marine molluscs have been discovered in the past decade. With the task of gathering the names for all marine species approaching completion, the focus has shifted to improving the consistency and quality of data, while still keeping pace with the addition of the > 2000 new marine species described annually. As part of our 10-year celebration, we redefined the priorities and longer-term aims for the WoRMS database and have shown users how names are input and why they are represented as they are (Horton et al., 2017). Keeping an up-to-date list of the world’s marine species is not just for interest but also increasingly important for the protection of our oceans. Extinctions from habitat loss and climate change are progressing at alarming rates. Around 20% of marine species are at risk of extinction and we urgently need to document what species are present, and what is happening to them in order to better understand the causes and devolop possible prevention measures. Biodiversity also underpins many features of the environment that humans depend on. Each new species discovered could provide opportunities for advances in medicine or agriculture. In 2018, to celebrate a decade of WoRMS’ existence, it was decided to compile a list of our top marine species, both for 2017 and for the previous decade in order to highlight the fascinating discoveries of the numerous new marine species being made every year. A list of the ‘Top Ten Species’ described from ALL habitats and taxa has been announced annually since 2008 (http://www.esf.edu/top10/). Although this list often contains one or two marine species, we decided to pay homage to the ‘largest habitat on earth’ by producing our own list of the top marine species. We hope some of our favourites will make it to global list. How were the species chosen? All editors of WoRMS were given the opportunity to nominate their favourite marine species from both the last year (2017) and the previous decade (2007-2017). A small committee (including both taxonomists and data managers) was brought together to decide upon the final candidates. The final decisions reflect the immense diversity of animal groups in the marine environment (fish, crustaceans, molluscs, corals, sponges, jellies, worms) and highlight some of the challenges facing the marine environment today (e.g. invasive species, fragile reef ecosystems threatened by climate change, deep-sea environments impacted by resource extraction). • Monday, May 14th: Dr. Linwood Pendleton, Global Ocean Lead Scientist at the World Wide Fund for Nature. • Tuesday, May 15th: Professor Emma Johnston, Dean of Science, University of New South Wales, Sydney, Australia. The 4th World Conference on Marine Biodiversity is glad to announce the participation of several exhibitors present at the Montreal congress. To access the list, click here. Join the 1-day symposium titled “North Atlantic VMEs, EBSAs and MPAs in a changing ocean”, which will be held in Montreal on May 12th 2018, just before the opening of the 4th WCMB, as part of the EU-funded ATLAS project. Program details are available on the website. More details related to the program will be available shortly. Stay tuned! Registration is free but spaces are limited! Registration deadline is April 30th 2018. The 4th World Conference is active on social media! Follow us on Facebook and Twitter! Be a part of the conversation and be the first to get the last news. From 17 till 21 September 2018, the Flanders Marine Institute (VLIZ) and LifeWatch Belgium will be organizing the 53rd edition of the European Marine Biology Symposium (EMBS53) in Ostend, Belgium. Don’t hesitate to share this event with your network. Thank you. SCOR is now accepting proposals for new SCOR working groups. Proposals are due by 12:00 p.m. UCT on 16 April 2018. Proposals will be posted after that time on the website and open to review by national SCOR committees and others until 1 August 2018. Decisions about which proposals will be funded will be made at the annual SCOR meeting on 4-6 Sept. 2018 and new groups will start in 2019. The Deadline for application 28/02/2018 h. 12.00. British Antarctic Survey (BAS) is a member of the European Marine Biological Resource Centre (EMBRC) UK node. EMBRC is a group of leading European marine research centres, which is also known as a distributed Research Infrastructure (RI). 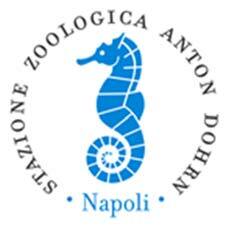 It provides access to European coastal seas and the endemic fauna, with the addition of Antarctica via BAS. As part of EMBRC, ASSEMBLE PLUS brings together and opens up research infrastructures to all European researchers in the marine field, from both academia and industry. Researchers can apply for funding bi-annually to collaborate with BAS and collect samples and specimens from the BAS Rothera Research station in Antarctica. For further information and to apply click here.